Lipp offers a range of metallic materials suitable for use with a wide variety of media, from pure water to problematic and aggressive substances. Those materials range from galvanised/black steel through the combination material VERINOX to high-alloy stainless steels. VERINOX stainless steel is a patented, award-winning combination material that offers the properties of high-quality stainless steels, e.g. 1.4301, 1.4571 or 1.4539, at the cost of galvanised steel and has been in use for more than 20 years. The highest quality and longevity of materials are our top priorities. Lipp is a certified specialised company according to article 19 of the German Water Resources Act, paying particular attention to the durability of its products, a professional execution and a solid workmanship in every detail. Lipp is approved welding manufacturer in tank, machine and steel construction according to DIN EN ISO 3834-2, to ensure professional welding operations. Lipp is certified to calculate and manufacture structural components and steel structures up to EXC3 class according to DIN EN 1090-2. 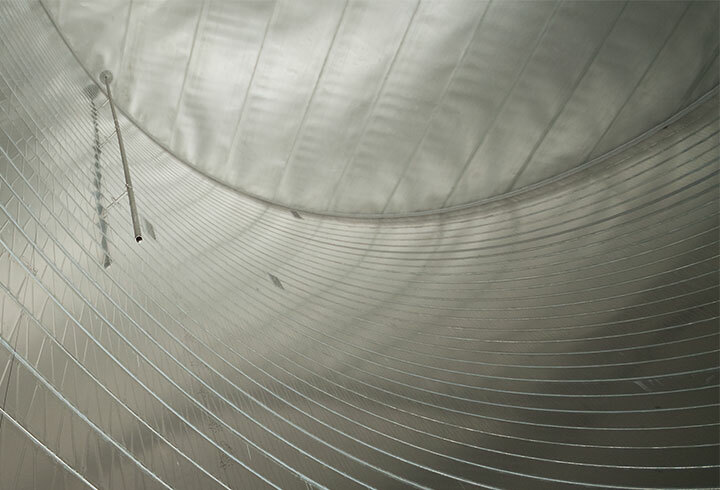 Lipp is certified to construct Tanks from steel sheet using Double-Seam technology, according to the German Institute of Construction Engineering (DIBt). Lipp fulfils the requirements of a systematic and effective work safety on basis of the German AMS BAU, an occupational safety management system for industrial companies. Duplex material from a galvanised steel band on the outside and a stainless steel band, e.g. 1.4301 , 1.4571 [316Ti] or 1.4539 [904L], on the medium side. e.g. sewage gas, landfill gas, biogas, sewage sludge, sugar beet, bulk goods, etc. Aggressive or sensitive media often require the use of high-alloy, corrosion-resistant stainless steels. Lipp offers stainless steel tanks which meet the highest quality requirements for storing these materials correctly. Tanks are available in welded designs produced using the LIPP welding technique as well as in folded designs with the LIPP Double-Seam. Stainless steel tanks are available in a range of grades including 1.4301 and 1.4571. Other grades are available on request. Besides tanks, the Lipp portfolio also includes stainless steel roofs and covers and stainless steel bottoms. Material, strength and diameter can be optimally tailored to suit the individual application. Accessories and attachments in stainless steel complete the corrosion-resistant finish of the tank, providing a uniform high-quality media storage facility. Steel and stainless steel are becoming increasingly expensive; however, special stainless steels are indispensable for the storage and processing or handling of liquids. Lipp has developed the duplex material, Verinox, to make optimal use of the economic advantages of the Lipp Double-Seam System in these applications. The interior of each container or tank design is doubly lined with stainless steel throughout, while the exterior is galvanised steel from top to bottom. The decisive economic advantage: the same benefits at lower costs! Lipp received the Dr Rudolf Eberle Award (award for innovation in Baden-Württemberg) in 2005 and the German Steel Innovation Award in 2006 for this pioneering invention. Stainless steel is expensive. Verinox offers the same level of quality as the conventional material used for the construction of tanks and containers while using less stainless steel. 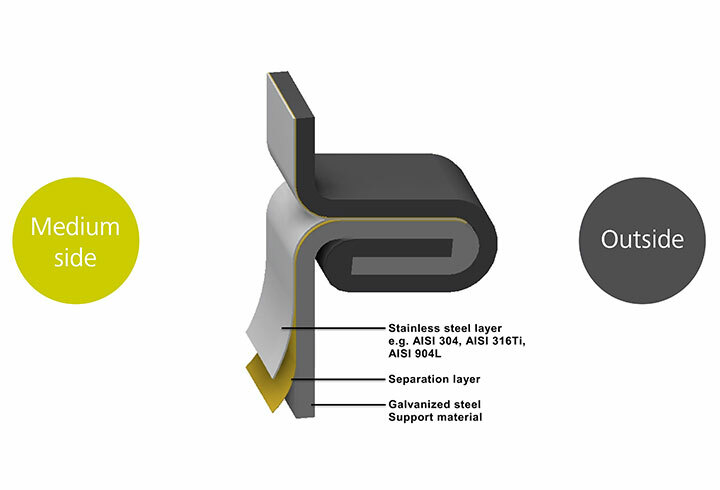 With Verinox – the duplex material developed by Lipp – a sheet of stainless steel is joined to a sheet of galvanised steel by means of a separation layer. Three components form the basis for this material that is ideal for tank and container construction: not only does it have outstanding physical properties but it also uses a reduced quantity of expensive stainless steel, resulting in lower costs. With this invention, Lipp has successfully retained the economic benefit of the LIPP Double-Seam System while improving the material savings made. A simple steel or galvanised sheet is sufficient for the outside of containers or tanks as it will only have to withstand normal weather conditions. Verinox is produced in-house using customary components in the form of a rolled strip. Following optimum preparation by the experienced assembly team, tanks are constructed using Lipp’s optimally automated and efficient production method that has been proven the world over. So the best possible cost-benefit ratio is also ensured during construction. VERINOX tanks are suitable for storing problematic or sensitive media including water, waste water, sludge, manure, feed as well as a variety of intermediate and end products from the chemical, pharmaceutical and plastics industries. Lipp uses galvanised or black steels for conventional tank construction. LIPP tanks in galvanised steel are produced with the LIPP Double-Seam while black steels can be both folded and welded using the LIPP welding technique. Welded tanks are available with wall thicknesses of up to 6 mm. Tanks with wall thicknesses of up to 8 mm are currently under development.